Founded in 1755, Salisbury was named the seat of newly formed Rowan County. By the late 19th century, the town had become a railroad hub, with trains passing through town heading to points north, south, east, and west. In the 20th century, Salisbury developed an industrial economy, based largely on textiles. By 1950, there were over 100 manufacturing plants in the Salisbury area In recent decades, much of this manufacturing base has left Salisbury. As in many other Southern towns, Jews established a small but strong community that has tracked the fortunes of Salisbury itself. The first recorded Jews to settle in Salisbury were Victor Wallace and his family. Wallace immigrated to South Carolina from Hesse-Darmstadt in Germany just before the Civil War. After fighting for the Confederacy, Wallace worked for his brothers David and Isaac, who owned an herb business in Statesville, North Carolina. By 1870, Victor had moved to Salisbury, where he opened a small store of his own. He and his wife Fannie then had four children. His sons Jacob and Leo later joined the dry goods business, which was renamed V. Wallace and Sons. While Victor seemed satisfied with the relatively small store, Leo and Jacob had larger ambitions, expanding the business and establishing a wholesale operation in 1901. Due to the efforts of the two brothers, the business grew from annual sales of $5000 in 1885 to over $1 million by 1918. 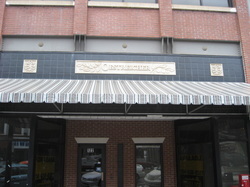 Their retail store became one of the largest operations in the southeast. Each week, wagons loaded with Wallace merchandise left Salisbury for towns across North Carolina. The brothers acquired a fleet of horses to pull their wagons. Later, Jacob and Leo moved into the real estate business, buying a tall downtown building in 1914, which they renamed the Wallace Building. In 1926, the brothers closed their merchandise operation, focusing on their real estate business. The Wallace brothers owned and developed much of downtown Salisbury. Leo Wallace Jr. took over the business in 1935 after his father and uncle had died. At some point in the early 20th century, the Wallace family left the Jewish faith, but when Charles Wallace died in 1979, he left money to the Salisbury Jewish congregation in his will. David Oestreicher, who married Jacob and Leo Wallace’s sister Rachel, was the next Jew to set down permanent roots in Salisbury. Oestreicher left Germany for America in 1882. He lived in Charlotte and later Wilson, North Carolina, before moving to Salisbury in 1902, where he opened the dry goods store Dave Oestreicher. Oestreicher sold a variety of goods, including exotic Chinese matting that was used as a floor covering. The business grew quickly as Dave Oestreicher became one of the nicest high-end clothing stores in the state. In 1916, it was the first local business to use a truck to deliver merchandise. When David died while on a trip to Germany in 1923, his son Irvin took over the business, which he ran for the next 34 years. Like the Oestreichers and the Wallaces, the small number of Jews who lived in Salisbury in the early 20th century concentrated in retail trade. Jacob Feldman emigrated from Poland in 1890, and owned a store in Salisbury by 1900. His children later worked at the family clothing store, which was called “J. Feldman & Sons.” By 1922, Jacob had moved to New York, while his sons Charles and Harry ran the store. Aaron Nurick left Russia in 1895, and lived in Virginia before moving to Salisbury in 1907. By 1910, Nurick owned a clothing store in town, which remained in operation for over 70 years. Although there was no local Jewish congregation at the time, David and later Irvin Oestreicher and the other Jewish merchants in Salisbury would close their stores on Rosh Hashanah and Yom Kippur. By 1937, only 38 Jews lived in Salisbury, though a growing number of Jewish merchants began to settle in the town. In 1939, Sam Zimmerman moved from Marion, Virginia to Salisbury, where he opened Zimmerman’s clothing store. Zimmerman had a unique way of attracting customers, standing outside his establishment with a cane and literally pulling them into the store. J.L. Goldman, a native of Birmingham, Alabama, opened the Gold Shop in Salisbury in 1940 after spending time as a traveling salesman. Both stores became regional chains, as Zimmerman’s had branches in Lexington, Concord, and Statesville while the Gold Shop had as many as 20 locations at one time. By 1942, other Jewish owned businesses in Salisbury included Dave Oestreicher, Nurick’s, J. William Chinn’s Darling Slipper Shop, K. Troutman’s Department Store, Joseph Cohen’s Reliable Sales Store, Phil Levinson’s Family Shoe Store, and Guyes ladies clothing store. In 1940, this growing number of Salisbury Jews began to organize. The women took the lead, establishing a chapter of the Council of Jewish Women and soon after forming a religious school for their children. Initially, the Sunday school met in Phil Levinson’s guest house. The school did not last too long, and soon Jewish children in Salisbury were traveling to Charlotte each Sunday for religious instruction. In 1944, thirteen Jewish families formally established a congregation and began worshiping together regularly in private homes. Phil Levinson was the first president of the group, which named itself Temple Israel. Soon, they rented an upstairs room in the Yancy Building and brought in Reform Rabbi Phillip Frankel to lead services. In 1945, under the influence of New York-born Harry Feit, the congregation became Conservative. By 1952, Temple Israel had 23 member families. They were committed to building a permanent home for the congregation. In March of that year, they bought land; construction work started quickly. J.L. Goldman headed the building committee, which raised $7,000 in addition to many pledges from Jews in other towns. For Rosh Hashanah that year, the congregation was able to hold services in its not-yet-completed building. In March of 1953, the congregation officially dedicated its new synagogue. A prominent local judge, Hubert Olive, was the keynote speaker at the ceremony, which drew 175 people and was broadcast over a local radio station. In his address, Judge Olive, who was a Southern Baptist, stressed the theme of brotherhood and declared that he appreciated the invitation to speak at the dedication “more than any other invitation I have ever received.” Other dignitaries who spoke at the event included Salisbury mayor E.L. Hardin, James Hay, who was the head of the local ministerial association, state legislators Arthur Goodman and George Uzell, Charlotte businessman and Jewish community leader Morris Speizman, and Harry Golden, the editor of the Carolina Israelite. Temple Israel had a number of service leaders in its early years. Rabbi Aaron Tofield of Charlotte would come to Salisbury occasionally to lead services. Rabbi Tofield and Cantor Samuel Leib officiated at Temple Israel’s dedication service. George Ackerman, a merchant in Fort Mill, South Carolina, was hired to lead services at Temple Israel for several years, even though he was not an ordained rabbi. Ackerman would travel to Salisbury for the High Holidays and periodically during the rest of the year to lead Shabbat services. Later, the congregation was served by the area circuit-riding rabbi program started by I.D. Blumenthal of Charlotte. In 1972, they hired Israel Gerber, a retired Reform rabbi from Charlotte to lead services twice a month. Two years later, Temple Israel began to bring in student rabbis from the Jewish Theological Seminary in New York to lead High Holiday services. Over the years, Temple Israel has relied on various part-time and visiting rabbis as well as educated lay people to lead services and teach their children. Temple member Ben Shapiro trained 17 boys and girls for their b’nei mitzvah in the 1970s and 1980s. Temple Israel expanded as the Jewish population of Salisbury grew. In 1957, the congregation bought land for a cemetery. Ten years later, they renovated their synagogue, with significant financial help from the Sisterhood. By 1971, there were 32 member families, many of which had young children. 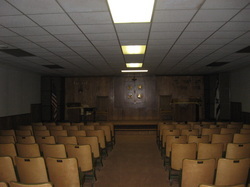 As a result, Temple Israel added a 2000 square foot social hall and education wing to their synagogue. Mort Lerner, the president of the congregation at the time, donated $10,000 toward the new wing in memory of his brother Irvin. Students in the Sunday school helped raise money for the expansion by selling candy. They formally dedicated the addition in 1972 with Morris Speizman of Charlotte as the guest speaker. Salisbury Jews founded a joint chapter of the B’nai B’rith Youth Organization with Hickory and Statesville in the 1970s to give their children a Jewish social outlet. The Salisbury Jewish community was very close-knit, holding regular social events like dances, card parties, and fundraising dinners at the synagogue. Partly, this was a response to the social exclusion they sometimes experienced in town. By and large, Jews were excluded from the local country club. While they were active in the downtown business community, Salisbury Jews were not a part of the town’s political power structure. Mort Lerner was the only Jew to serve on a local bank board. Nevertheless, Jews were involved in many segments of the local economy. Leon Stein owned a swimsuit manufacturing company, while a handful of Jewish doctors worked at the local Veteran’s Administration Hospital by the 1970s. the store is long gone. Over the last several decades, Jewish stores, which once lined Salisbury’s downtown streets, have become virtually extinct. After the Oestreicher Store, which had been bought by the Asheville-based Winner Company, burned in 1964, Ben Shapiro and a group of local investors reopened the store as Oestreicher’s. They sold the business to an Atlanta company in 1970 that changed the historic store’s name. 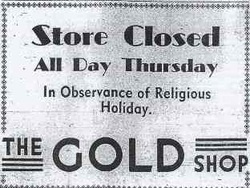 The Gold Shop closed its last location in 1981. Zimmerman’s, now run by Leon Zimmerman, closed in 1988. These old family-run downtown stores could not compete with the new shopping mall and chain stores that moved into Salisbury. In addition, many of these merchants’ children had gone to college and had different career ambitions than running the family store. The deterioration of Salisbury’s textile industry hurt local business as well. The decline of Jewish businesses in Salisbury has taken its toll on Temple Israel. In the 1960s and 70s, the congregation was at its apex, with many children in their religious school. Most of the children raised in the congregation during this era did not return to Salisbury after college, choosing the greater economic and social opportunities in larger cities like Charlotte, Atlanta, and Greensboro. As a result, the congregation has experienced a drop in membership. In recent years, they have rented their building out to church groups on Sunday mornings; this extra income has helped sustain Temple Israel. In 2010, there were about 15 member families in the congregation. While most members are elderly, there are also a handful of young families who live in nearby towns like Concord and Albemarle. Although Temple Israel’s membership has been in decline, the congregation still remains vital with a small religious school, and a part-time rabbi.